I welcome all feedback on my blog, so if you would like to get in touch, please drop an email to becxblogs@gmail.com. Feel free to contact me on my social media. I am PR friendly and am always interested in hearing if you want to collaborate in some way. 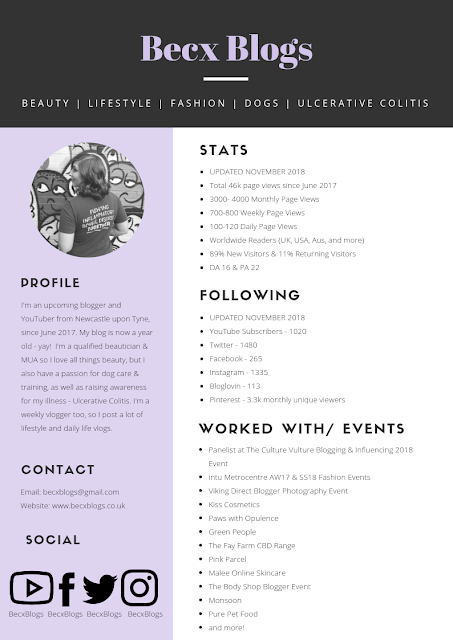 If you would like to contact me for work or business purposes please email me on becxblogs@gmail.com. Please note, I will only work with brands I have a genuine interest in, that do not test on animals and are cruelty-free. All thoughts and comments will be honest, and 100% my own. I do not accept pre-written content and my reviews will never be swayed by sponsorship or payment. Media Kit updated NOVEMBER 2018.